Nose: Deep rich fruit cake with ripe plums, prunes and spicy ginger complemented by delicate toffee and vanilla notes. There's also some flowery flavours coming through with gentle violet along with creamy malt. Palate: There’s luscious, rich fruit cake again with plums, raisins and a big shot of vanilla sauce. Sweet and fruity with a touch of sherry coming through along with liquorice notes, malt, orange peel, herbal notes and gentle ginger spice. Soft, even velvety, and mouthfilling. A very satisfying palate. Finish: Warm and intense. Sweet, fruity and creamy with a long and lingering spicy finish. With water: Yes, now the whisky awakes and becomes more vibrant and vigorous. Sweet, fruity with increased herbs and lingering oaky flavours. Elegant and delicate. Comments: A confident, well-rounded cask strength expression. Elegant and complex with a huge range of different flavours. Not at all overpowered by the oak. A splash of water opens up the flavours and get this sweet and fruity whisky singing. Colour: Deep mahogany ("almost black"). Nose: There is a wonderful initial burst of alcohol which disappears quite rapidly and makes room for delicate sourish red currant along with a whiff of balsamic vinegar. This is followed by a rich sweetness of stewed dark fruits, cherries, grapes, and sultanas soaked in rum, perfectly supplemented by sherried X-mas cake, a touch of marzipan, and mixed spices. Palate: Oh boy, this is sweet on the palate with lots of stewed fruit, cherries - more the light red ones, and a delicate sourness caused by balsamic vinegar. Satisfying hints of oaky tannins emerge, complementing a lingering nuttiness. Very enjoyable and mouth-coating. Finish: Long and warm with a fruity sweetness and lingering marzipan and walnut notes. With water: Vibrant and prickling. Stays sweet with rum soaked cherries coated with dark chocolate, while delicate oak aromas develop in time. Superb. Comments: This is an amazing dram. Bold, fruity with a gorgeous balance between sweet and sour flavours. Very powerful and already quite complex considering its youth. A goody for the sherry aficionado! Nose: The first thing which jumps out of the glass is sherry, along with lots of dried fruits, apricots, plums, sultanas, and raisins. Followed by toffee and X-mas cake, mixed with winter spice, acacia honey, cinnamon, and pepper. Hints of old damp wood and furniture polish coming through. Very pleasant on the nose! 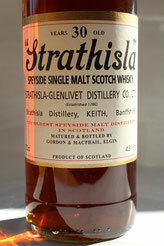 Palate: Soft and sweet, heavily sherried with dark ripe fruits - cherries and plums. Toffee, spicy honey, fine tones of marzipan and again polished furniture are coming through. Dark chocolate and winter spice at last. An enjoyable mouthfeel. Finish: Warm and powerful with medium length. Sweet cherries, soaked in old sherry with lingering dark chocolate and oaky spice, mixed with a hint of nutmeg. Gets drier in the end. Very well-balanced and mouth-coating. With water: Mouth-warming with increased sweetness, sherry and vanilla, with subtle hints of dark honey, a whiff of gooseberry and lingering milk chocolate. Comments: Sherry at it's best! A rich expression of a venerable sherry maturation. 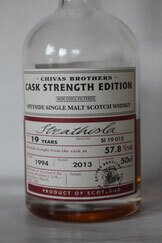 Very well-balanced old style whisky, perfectly matured. 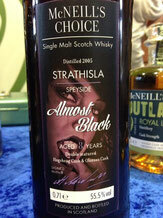 This one will delight sherry cask aficionados, if you are lucky to get your hands on this rarity.